Fortunately when Sandy hit landfall winds were down to 80 miles per hour and she was no longer a full hurricane. But with a death toll that has already reached 88, estimated economic losses exceeding $50 billion, and over 3 million people still without power, her impact was still massive. At times like this we are especially proud to be part of an industry that exists to help people rebuild. Much of the damage in this case has been due to flooding, which is not covered by homeowners insurance. But estimates are that up to $20 billion of the losses will be covered by insurance. As agents, carriers, and adjusters work with customers all over the affected areas, the public will once again have the chance to see our industry come through for those in need. 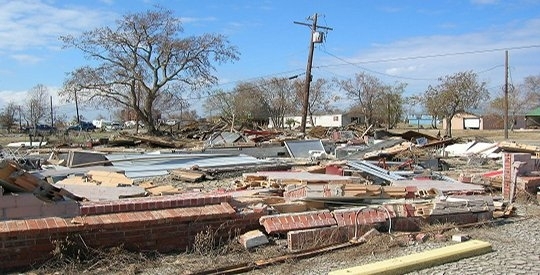 While we would never compare our experience to the devastation suffered by many on the coast, over 1,000 miles away we were directly impacted by Sandy, and we learned some lessons the hard way as a result. This sounds so silly, and we thought we had it covered. Our systems are located in two data centers hundreds of miles apart and in the middle of the country in areas not susceptible to natural disasters. The two locations are on different power grids, with multiple connections to the internet and backup power. But we outsource our email. Our email provider also has two data centers. But they’re only 100 miles apart. And they’re both on the coast – in New York City and New Jersey. As a result – and because of one more important lesson they hadn’t learned yet – for almost two full days we found ourselves without email. In addition to email being down for almost two days we had another internal service we use go down for a few hours. Their experience was enlightening, to say the least. Their data center was on the 17th floor in a building in downtown Manhattan. So far so good. It had huge backup generators to provide power in case the electricity went out – which it did. Generators require fuel, though. So they had big tanks of diesel fuel in the basement. Still fine. But the pumps that pumped the diesel fuel from the basement to the 17th floor were also in the basement. Below sea level. Just a few blocks from the Atlantic Ocean. The basement flooded almost immediately, rendering the pumps (and therefore the generators) completely useless. In order to restore power they literally had to form a bucket brigade and carry diesel fuel up 17 floors a few gallons at a time. Our email provider had a similar issue at both their data centers. It’s mind boggling that no one had thought to consider the impact of flooding – only of a power outage. Reviewing contingency and backup plans with each of our vendors. Ensuring that their (and our) backup plans consider multiple failures for different or multiple concurrent causes. Switching to vendors with better contingency plans. You may want to consider the same. Our thoughts and prayers are with those struggling to rebuild. If you would like to help personally, we recommend that you text the word REDCROSS to 90999 to donate $10 to American Red Cross Disaster Relief. The Red Cross has an amazing history of helping people in situations exactly like this. Most Texas counties are experiencing severe drought. Especially this weekend, remember that just a little spark can start a massive wildfire. The Texas Forest Service continues to urge caution when it comes to any outdoor activity that can cause a spark – from outdoor grilling or building a campfire to parking a car on dry grass or shooting celebratory fireworks in approved areas. More than 90 percent of Texas wildfires are caused by humans, with the most frequent cause being debris burning. While we’re facing these drought conditions, don’t use fireworks and don’t burn debris. The Texas Forest Service performs many valuable services including seminars such as these which are given throughout the state. Keep an eye on their website for seminars in your area. For example, landowners in Hardin and Tyler counties who have been affected by recent wildfires are invited to a workshop July 7 to learn how to restore their land in the aftermath of a disaster. “We want to let citizens know what resources are available to them as they recover from these tragic wildfires,” said Carrie Smith, a forester with Texas Forest Service. The informational “After the Fire” workshop will be from 6 to 8:30 p.m. Thursday, July 7, at the Wildwood Meeting Hall, 2201 Button Willow, Wildwood, Texas. Representatives from partnering agencies – Texas Forest Service, Wildwood Volunteer Fire Department, Big Thicket National Park Service, Natural Resources Conservation Service, Texas AgriLife Extension Service and The Campbell Group – will be on hand to help answer questions. Topics include planting, arson awareness, assistance from NRCS and “Firewise” safety principles. Similar workshops are being held in other areas around the state as well. See https://texasforestservice.tamu.edu/main/default.aspx for more details. You can help the volunteer fire departments that have been battling the devastating 2011 wildfires by donating directly to the volunteer fire department of your choice. The great folks at the Texas Forest Service have established the VFD Emergency Assistance Fund to help volunteer fire departments. Donations are tax deductible and can be earmarked for particular departments, counties or regions. ALL proceeds (yes, the full 100 percent of every donation) will be distributed to volunteer fire departments via grants for firefighting expenses. Checks should be made payable to Texas Forest Service. Indicate the specific department, region or county department that you’d like to support on the check. If you have additional questions about how you can help, email HelpingTexas (at) tfs.tamu.edu. Two years ago today Hurricane Ike slammed into the Texas coast as a Category 2 hurricane but with a storm surge the equivalent of a Category 5. It was the third costliest hurricane in U.S. history (behind only Andrew and Katrina), with almost $30 billion in damages. We have not yet found any way to prevent a hurricane, or tornado, or any number of other natural disasters. But we can and should be proud of the critical role the insurance industry plays in replacing or repairing damaged property in these catastrophes. Being prepared is key to filling that role in the best way possible. Make sure your customers know about the damage caused by Ike and other natural disasters and their coverage options including national flood and state wind policy options, if applicable. Review your agency’s disaster recovery plan. How will you access your documents and systems if your office is inaccessible? How will your insureds know how to reach you?